Peter Green, head master at Rugby School, recently told a group of visiting journalists that England historically was not a particularly religious nation and had no concept of eternity. So cricket was invented. You might expect such a joke from the leader of the school where the fast-paced game of rugby started. What’s startling is that a descendant of that game is becoming America’ version of eternity. Don’t think so? Then you must not have sat down in front of your TV at 5:30 Sunday night to watch the Seattle Seahawks lose to the Arizona Cardinals. It took two hours to get to half time, more than two hours after that to reach the end of time. More than four hours to play 60 minutes of football. The National Football League has long presented football made for TV commercials to a patient American audience willing to watch more sales pitches than forward passes. Ads could be seen as the first step into the everlasting. Except that American football in its evolution from the game that started at Rugby School in 1823 has devolved into a series of set pieces alternating with the players gathering to decide what to do next. That’s hardly a good starting point for continuous athletic entertainment. Reviews: This seems headed for the ultimate in interrupted action: The referees huddling to review the last play while the players meet to plan the next play. One review in the Seahawks-Cardinal game was over whether a player had caught the ball. This version of football has been played for more than 100 years and it has to review what constitutes a catch? In the interest of the game, it might be wise to leave some things up to the observation of the referees on the field and just live with it. That hardly seems where the NFL is going. At one point in the Seahawks game, the reviewing referees got word that New York wanted to review the play. Is there some Supreme Being in New York who can see more than we can in Seattle? If the league keeps going in this direction, games will take longer than the appeals in death-penalty cases. Wait, that’s it! Let’s have the Supreme Court do the reviews. Challenges: Right now it’s just another way to add more reviews and lengthy interruptions to the game. But it could be a way to limit the number of reviews. Give each coach two of them per game on any call they want and they (and players, fans and the league) have to abide with the referee forever on everything else. Non-plays: When is the NFL going to get rid of these? A team scores. Go to commercial. Extra point kicked. Go to commercial. Back to the game to watch the kickoff sail through the end zone or be downed there. Go to commercial. Change the rules so that the kickoff must stay in the field of play and must be run out of the end zone or it’s a safety. Limit the fair catch on punts to within the 20-yard line. Or make punts a “live ball” – kick it, recover it and you’re still on offense. Make throwing the ball 40 rows into the stands intentional grounding. Make “taking a knee” a five-yard penalty – or add time on the clock for each time a quarterback stalls the game. In other words, make teams play the full game. A spectator sport should be worth watching, and that means showing athletes playing the game. The NFL needs to do more to make the players play the game. Cut the “shot clock” to 15 seconds between plays. 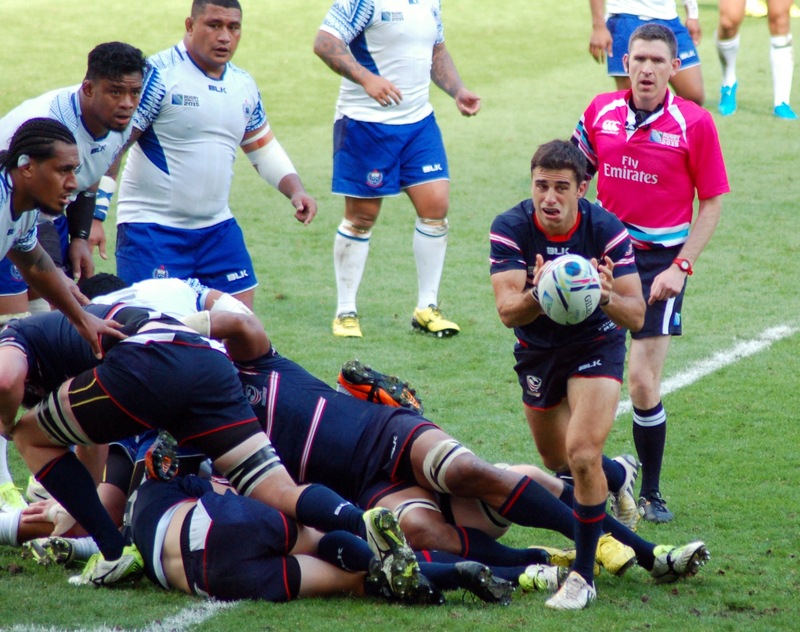 If you watched or played in the recent Rugby World Cup (and five players from Washington state did), you’d know that it was possible to go to the stadium or watch the game on your TV and be done with it – out of the stadium or out of your lucky TV viewing chair — in a little more than two hours. And you would have watched 80 minutes of football filled with passing, tackling, kicking, scrummaging and lots of running with the ball. 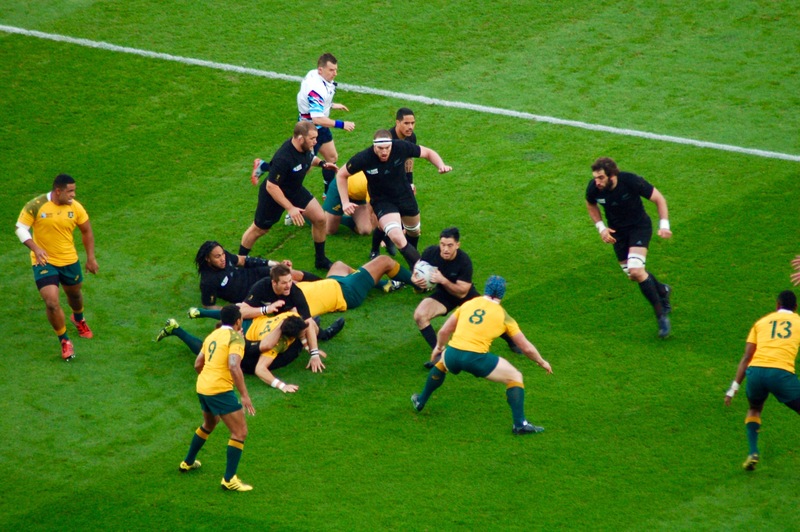 It’s not all action for all 80 minutes, but most of the non-playing time comes from players getting into position for set scrums and lineouts, the way the game of rugby restarts the action. It’s not from “managing the clock” by not playing as in the NFL. Three NFL games were played in London this season, and there has been talk in the British press about a possible franchise in that city. If the United Kingdom turns away from their own games, they’ll wonder why they didn’t just stick with the eternity they already had. 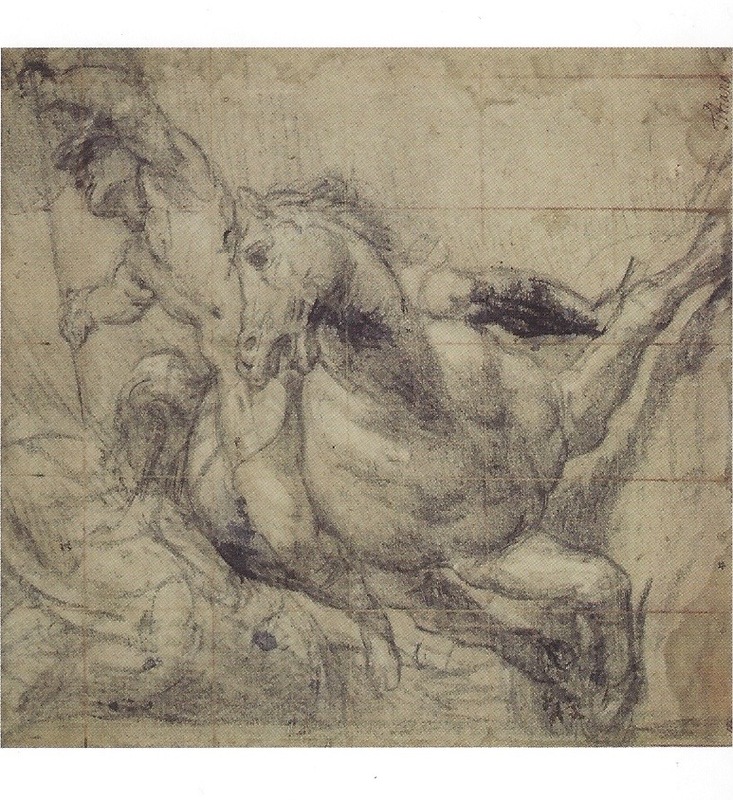 “Horse and Rider falling” by Titian (c. 1485/90 – 1576), black chalk on gray paper. A postcard from a special exhibit at the Ashmolean Museum in Oxford. First choice for the favorite museum we visited during our recent two months in England isn’t a museum; it’s the Bodleian Library. But when the Bodleian rolls out some of what it has been collecting since Sir Thomas Bodley (1545–1613) donated his fortune and a good portion of 2,500 books for a library for Oxford students, it plenty makes like a museum. Since Bodley’s donation in 1598, the library has collected more than 13 million books, manuscripts, paintings, letters and just about anything you would or would not expect in a library. This year, it put together an exhibit called “Marks of Genius,” an amazing display of the ability of human beings to create, to think, to write, to make music and to be . . . geniuses. A copy of the Magna Carta, Queen Elizabeth’s calligraphy, Asian painting, Shakespeare’s folios etc. etc. My only disappointment was that the library gift shop did not drop the price of the accompanying coffee-table book down from 40 pounds after the exhibit ended. “Marks of Genius” made clear a general truth about museums and their like: How well you like a museum may depend on a special exhibit being featured. That was true for us at the Ashmolean Museum in Oxford, the second museum on our list of favorites. The place has floors full of history, art, musical instruments, mummies, Roman statuary, but it also has regular special exhibits. We went to two of them, one on the miniature painter Adam Buck and another one entitled “Titian to Canaletto: Drawing in Venice.” While I could not impress an art historian with my knowledge of drawing in Venice after seeing this exhibit, I came away with a better understanding of the role drawing plays in the creation of art. I especially liked that one part of the exhibit had a display of the materials — ink, paper, charcoal, etc. — used by the artists. That helped me understand the drawings and why they looked like they did. The Ashmolean Museum showed us how a museum should be visited: again and again in small chunks. To do that you have to be around for a while and nearby, which we were for the Ashmolean. We visited three or four times, spacing out our trips over the eight weeks we were in Oxford. We chose the special exhibits for two visits, spent another trip on artifacts from the early history of England and followed a suggested “10 highlights in an hour” for another excursion. The 10 highlights? Powhatan’s Mantle (father of Pocahontas); Lawrence of Arabia’s robe; Mummy of Meresamun (about 830 -715 BC); Greek Octopus Jar (1450 – 1400 BC); Buddha from 200 AD; 1700’s Samurai Suit of Armor; Bodhisattva from 960 – 1127 AD; The Alfred Jewel, Anglo-Saxon (871 -899 AD); Uccello’s “The Hunt in the Forest (1397 – 1475) and Van Gogh’s “The Restaurant de la Sirene, Asnieres” (1853 – 1890). Making those visits to the Ashmolean made me realize how little I have followed this practice where I live. I’ve been in Seattle since 1976 yet have never set foot inside the Burke Museum on the University of Washington campus where I spent five years getting a graduate degree and another five years teaching. It wasn’t until I spent two seasons driving for Ride the Ducks of Seattle that I thought in all honesty I should visit some of the attractions I was touting to the people in the seats behind me. Since then I have made it to the Experience Music Project and done the Boeing factory tour, both of them with out-of-town visitors. I still need to make my first visit to MOHAI, the Museum of History and Industry. Looks like I need more visitors for me to take advantage of what is close by. Next on the list of museum favorites would be two museums that share another distinction that can make a museum special: They are on the site of some historical event. Bletchley Park was where the Allies worked to break the German code during World War II. The huts where the work was done are still there along with a museum that I barely got a glimpse of. Would love to go back. Same with the Churchill Museum in the War Rooms where he ran the show during the war. The rooms still have most of the articles that were there during the war supplemented by displays using modern technology to tell the story of the great English leader and the history in which he played a commanding role. 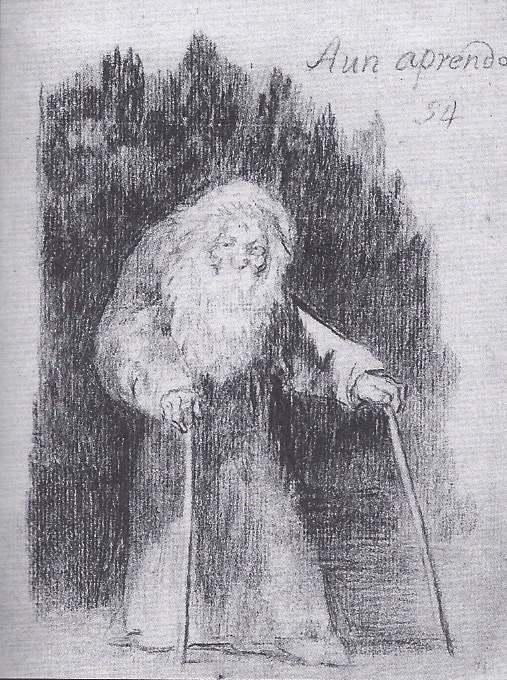 Goya drew this near the end of his life and wrote on it “Still Learning.” If I ever got a tattoo . . .
Then we come to the National Gallery in London, made special for us by the exhibit “Goya: The Portraits.” My knowledge of Francisco Goya was limited to his painting of the events of 2nd of May, 1808, his grotesque drawings, prints of which were once displayed at Davidson Galleries in Pioneer Square, and to the movie “The Naked Maja” starring Ava Gardner, a source of titillation in my youth (hey, that was pretty risque for 1958). Turns out Goya made his day-to-day living as a portrait painter, which was no easy task in Spain during the late 1700s and early 1800s. Kings came and went, and Goya worked as the court painter for more than one of them. He had to be a political chameleon to stay employed and alive. 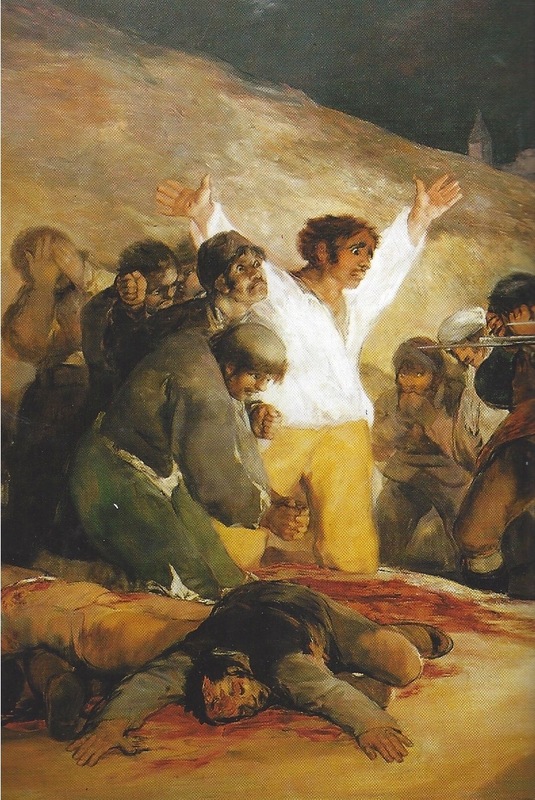 That only went so far, and Goya spent his last years with his liberal attitudes intact as a refugee in France. While working as a court painter he might flatter his subjects, once painting the queen of Spain with full cheeks even though by the time she sat for him she had lost all her teeth. The audio guide that went along with the exhibit noted that when Goya painted her she had given birth “to no less than 13 children.” She may have pulled out all her hair, too. In contrast to the portraits he did for paying royalty, when Goya painted his friends, family and himself, flattery played no role in what ended up on the canvas. He painted them literally warts and all. Last on the list of museum favorites is another one made special by an exhibit while we were visiting. The Christ Church Picture Gallery was showing a selection of art from the 200 paintings and 2,000 drawings left to the college 250 years ago by Gen. John Guise. 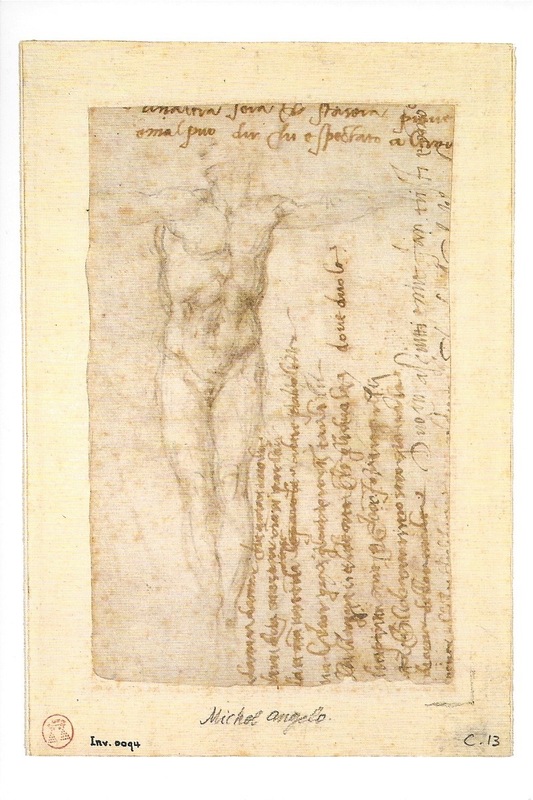 These included work by Leonardo da Vinci, Michelangelo, Raphael and Titian. It was another lesson in art history and appreciation, another experience in how much you learn by traveling. “The good thief (?) on the cross,” black chalk with some pen and brown ink on paper by Michelangelo (1475 – 1564). Postcard from the Christ Church Picture Gallery exhibit of the General John Guise collection. 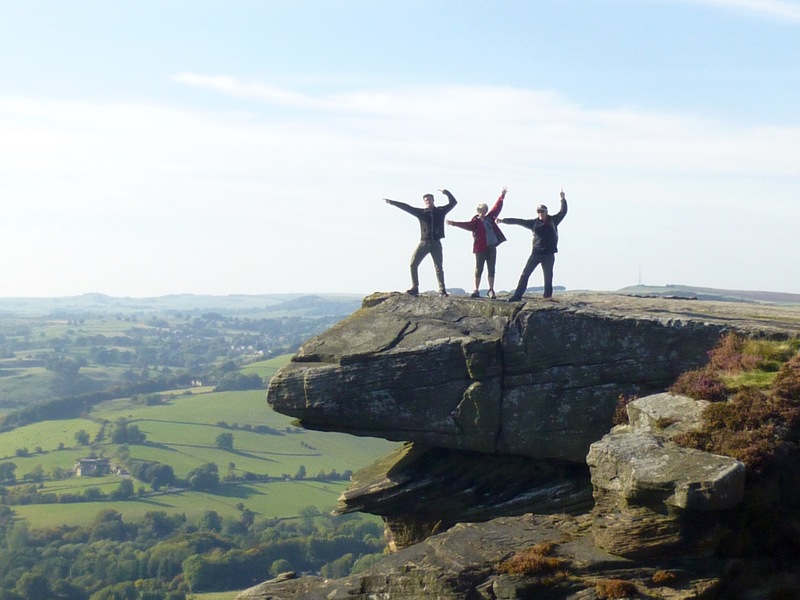 The Carpenters on the Curbar Edge. So Kathy and I have divided up the task of fulfilling Judy’s suggestion; I’ll do hikes and museums and Kathy will do plays and colleges/cathedrals/abbeys (that last category is further evidence of cheating). Has to be the Curbar Edge. It’s in the Peak District of north England and goes along an edge overlooking two villages, woodlands, pastures and other farmlands. You share the trail with cattle, rock climbers and other hikers. It helped that we had clear, sunny weather. 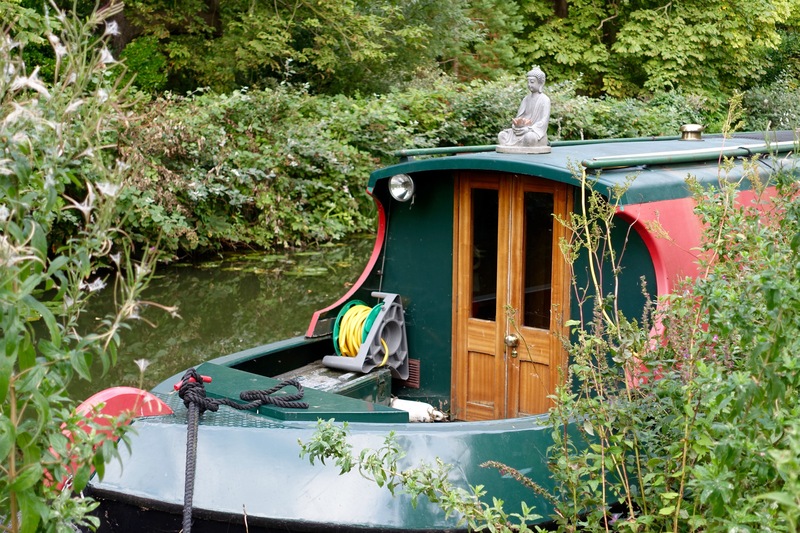 A narrow boat on the Oxford Canal. The walk along the Oxford Canal to Kidlington. One of our first walks after we arrived in Oxford. The route came out of a book that detailed the path all the way to Banbury. The eight miles to Kidlington and a stop at a pub gave us enough of the flavor of the canal to feel OK about not going farther. But we often walked along the canal to get into the central part of Oxford. Avebury stone circle. An ancient place with a stone circle around a rural village and a processional between more stones that leads to an mound built by unknowns, probably thousands of years ago. Oxford’s Port Meadows: The maps we had of Oxford showed that this meadow was near our flat. We made a loop out of it by walking back along the Thames River and we found one of our favorite pubs, The Perch in Binsey. To the Victoria Arms pub: Another walk in Oxfordshire, this one in the opposite direction of the Port Meadows but of course leading us to a pub, the Victoria Arms. Before you get there you pass through Oxofrd’s Univeristy Parks, past college playing fields and through the village of Old Marston. These paths are made for walking and we average five or six miles a day, with our longest day the sprint marathon in London. A great way to see things and to stay in shape (sort of — we both gained a couple of pounds; too much Guinness and tea cakes). 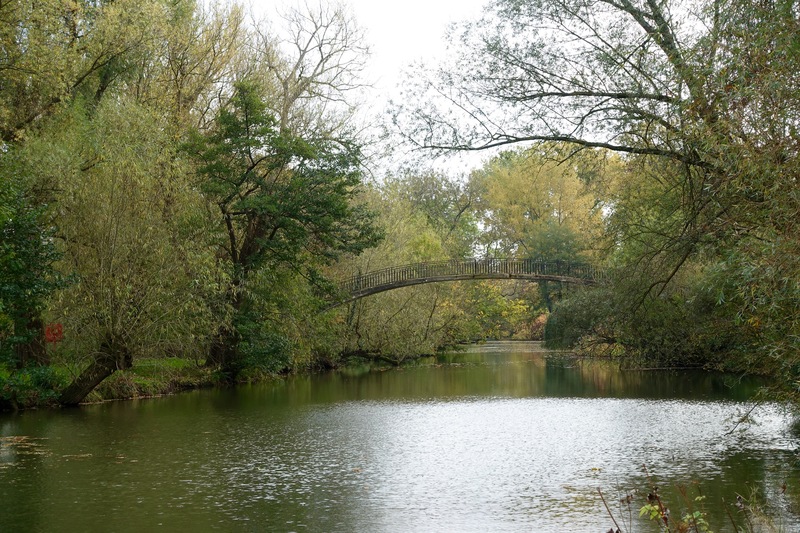 Bridge over the Cherwell River on the way to the Victoria Arms pub. The U.S. against Samoa. Are the Eagles condemned forever to be the team of the future? 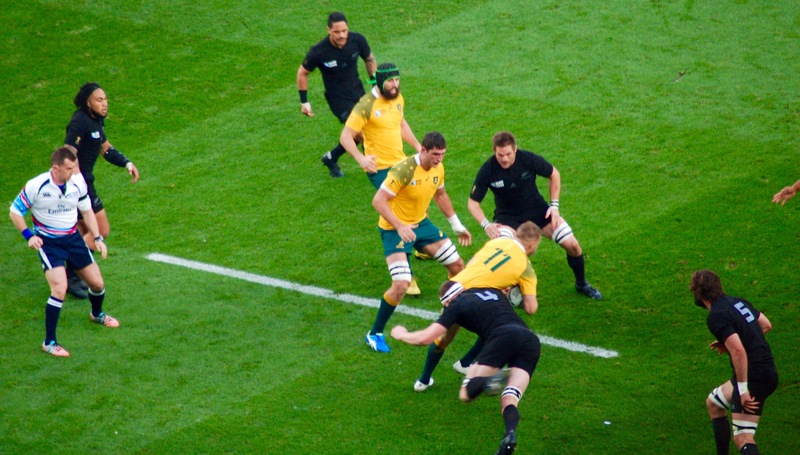 There’s a flip side to the best rugby matches in Rugby World Cup 2015, and that’s the games that disappointed. Not surprisingly, all of those are the matches that involved the United States team — four losses and no bonus points in the standings, which means they never came within seven points of an opponent and they never scored four tries in a game. The quickest way to list the disappointments would probably be to look at the margin between winner and the United States, and that would bring the South Africa game right to the top: 64-0 with the Springboks scoring 50 of those in the second half. Next would come the Scotland game, a loss by 23 points, then Japan (10 points) and Samoa (nine points). But did anyone expect the U.S. team to beat South Africa, even after Japan knocked them off the opening weekend? I didn’t. Maybe not lose by 64 points, but a win against the Springboks ranged beyond even my open optimism. Samoa and Japan seemed the games that the U.S. could win, but giving up 15 points on penalties against Samoa doomed that chance of victory. More penalties and poor defense sunk the chance of a win against Japan. Stuart Barnes, writing in The London Times, listed his first to worst teams and somehow the U.S. made it up from the bottom to No. 15, but I suspect his disappointment in England’s performance and a general dislike of things French put those two teams below the U.S. along with Canada, Tonga and Samoa. Right now that looks like the fate of U.S. rugby: The world’s forever future team.